Slotland has started introducing games from its sister site, WinADay Casino. A few weeks ago it was the deluxe Alice in Wonderland slot and this week its Slot 21 -- a slot game with a Blackjack bonus game. Try the new game for free this weekend! Slotland is offering a $17 freebie and generous deposit bonuses. 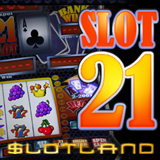 Slot 21 is a 21 payline slot with playing card numbers and symbols spinning on its five reels. The bonus round is inspired by Blackjack. By collecting Jacks, Queens, Kings and Aces on the slot machine reels, players earn “21 Cash” which can then be used to play a hand of blackjack. When they draw cards that come closer to 21 than the bank’s hand, without going over, their wager is doubled. Red & Black scatter symbols landing on Slot 21’s right most reel trigger an optional Red & Black Bonus Game where players can double the winnings of their last spin. Five Crown symbols wins Slotland’s site-wide progressive jackpot which is currently over $200,000 and considered by many regular players to be overdue for a win. The next WinADay games to come to Slotland will be Hold the Riches, which celebrates the good life with images of yachts, private jets, jewellery and vintage cognac, and Lost World, a dinosaur-themed game. I'll have news about them next month. At least one previous deposit required. All bonuses are valid January 26 - 31 only.